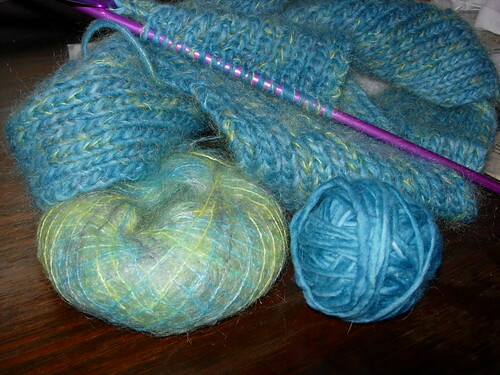 The beginning of Steph's scarf. I didn't get an after shot. It's Malabrigo wool with Katia mirage as the fuzzy stuff. The angora wool turned out far fuzzier than I anticipated, but I loooove the color. The pattern is from Last Minute Knitted Gifts, and is on size 10.5 needles, I think. It's K1P1, but doesn't knit up as quickly as I remember. It should be super warm, if winter ever arrives in Philadelphia.